یوسفی, فریبا, مجتبی زاده, حسین, پیشگاهی فرد, زهرا. (1395). تدوین مدل جامع برندسازی ابرشهرها (مورد مطالعاتی: ابر شهر تهران). فصلنامه جغرافیا ( برنامه ریزی منطقه ای), 24(1), 223-248. فریبا یوسفی; حسین مجتبی زاده; زهرا پیشگاهی فرد. "تدوین مدل جامع برندسازی ابرشهرها (مورد مطالعاتی: ابر شهر تهران)". فصلنامه جغرافیا ( برنامه ریزی منطقه ای), 24, 1, 1395, 223-248. یوسفی, فریبا, مجتبی زاده, حسین, پیشگاهی فرد, زهرا. (1395). 'تدوین مدل جامع برندسازی ابرشهرها (مورد مطالعاتی: ابر شهر تهران)', فصلنامه جغرافیا ( برنامه ریزی منطقه ای), 24(1), pp. 223-248. یوسفی, فریبا, مجتبی زاده, حسین, پیشگاهی فرد, زهرا. تدوین مدل جامع برندسازی ابرشهرها (مورد مطالعاتی: ابر شهر تهران). فصلنامه جغرافیا ( برنامه ریزی منطقه ای), 1395; 24(1): 223-248. اگر هدف ایجاد اقتصاد پایدار و توسعه متوازن شهری است، برندسازی شهری به‌ویژه در مقیاس ابرشهرها ضرورتی غیرقابل انکار است. با اذعان به عدم وجود مدل راهبردی جامع و متدولوژی اجرایی جهت برندسازی ابرشهرها، هدف اصلی این پژوهش، ارائه الگویی نوآورانه برای برندسازی ابرشهرها بر مبنای مطالعه موردی شهر تهران و با در نظر گرفتن ویژگی‌های منحصربه‌فرد ایرانی می‌باشد. جامعه آماری این پژوهش، کلیه خبرگان و متخصصان دارای زمینه علمی مرتبط با برنامه‌ریزی شهری و برندسازی می‌باشند. در این پژوهش، با توجه به روش‌شناسی تئوری زمینه‌ای، ابتدا از روش نمونه‌گیری مبتنی بر هدف (هدفمند) و سپس درروند تجزیه‌وتحلیل از روش نمونه‌گیری نظری برای گردآوری داده‌ها استفاده گردیده است. روش گردآوری اطلاعات مبتنی بر روش‌های پیمایشی به‌ویژه مصاحبه‌های عمیق نیمه ساختاریافته می‌باشد. همچنین روش تجزیه‌وتحلیل این پژوهش، تئوری زمینه‌ای مبتنی بر رهیافت نظام‌مند استرائوس و کوربین جهت کدگذاری و دسته‌بندی مفاهیم می‌باشد. در این راستا، از نرم‌افزار 16 SPSS جهت تحلیل داده‌های دموگرافیک کمی و همچنین نرم‌افزار MAXQDA 12 جهت مدیریت و سازمان‌دهی داده‌های کیفی استفاده شده است. نتایج این پژوهش حاکی از ارائه مدل جامع برندسازی ابرشهرها و تبیین ابعاد و متغیرهای کلیدی با رویکرد بومی می‌باشد. If the purpose is creating sustainable economy and symmetrical urban development, urban branding in scale of mega-city is necessary. 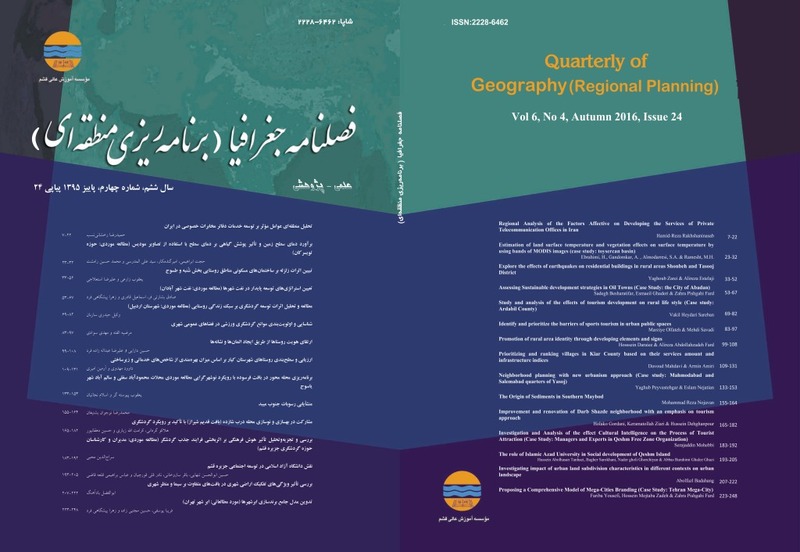 Since there is no comprehensive strategic model and performing methodology for urban planning, the main purpose of this research is presenting a new model for mega-cities branding based on Tehran city case study concerning the Iranian singular features. The research's statistical population is all the experts who have relevant scientific backgrounds in urban planning and branding. In this research, as for grounded theory methodology, at first purposive sampling method and then for analyzing data, theoretical sampling are used to gathering information. The data gathering method is based on survey methods specially partial-structural profound interviews. Also, the analyzing method is grounded theory based on Strauss and Corbin's systematic approach for coding and classifying conceptions. In this field, SPSS 16 for analyzing quantity of demographic data and also MAXQDA 12 for managing and organizing qualitative data, are used. The research results exposure a comprehensive model for mega-cities branding with explanation of dimensions and main variable based on local approach. Aitken, R., & Campelo, A. (2011). The four Rs of place branding. Journal of Marketing Management, 27(9-10), 913-933. Anholt, S. (2007). Competitive Identity The New Brand Management for Nations, Cities and Regions. New York Palgrave Macmilla. Anholt, S. (2009). Handbook on Tourism Destination Branding. Madrid World Tourism Organizatio. Anttiroiko, A.-V. (2014). The Political Economy of City Branding. New York Routledge. Bayraktar, A., & Uslay, C. (2016). Strategic Place Branding Methodologies and Theory for Tourist Attraction. PA Business Science Reference. Bayraktar, A., & Uslay, C. (2016). The Future of Mega-cities: Planning Implication for a More Sustainable Development. Berg, P.-O., & Björner, E. (2014). Branding Chinese Mega-Cities. Cheltenham, UK: Edward Elgar Publishing. Bulu, M. (2012). City Competitiveness and Improving Urban Subsystems: Technologies and Applications. Charmaz, K. (2006). Constructing Grounded Theory Calif: Sage Publications. Coshall, J.T. (2000), Measurement of tourists’ images: the repertory grid approach, Journal of Travel Research, 39 (1), 85-89. Davis, J. A. (2010). Competitive success, how branding adds value. Chichester: John Wiley & Sons. Dinnie, K. (2011). City Branding. New York Palgrave Macmillan. Gold, J. R., & Ward, S. V. (1994). Place promotion: the use of publicity and marketing to sell towns and regions. New York Wiley. Gulsrud, N. M. (2014). Green City Branding in Perspective. CITYGREEN, 1(8), 138. Hamm, B., & Muttagi, P. K. (1998). Sustainable Development and the Future of Cities (B. M. Hamm, Pandurang Ed.). London Intermediate Technology Publications,. Harris, J., & Williams, R. J. (2011). Regenerating Culture and Society: Architecture, Art and Urban Style within the Global Politics of City-branding. Liverpool: University Press. Ind, N., & Bjerke, R. (2007). Branding governance: a participatory approach to the brand building process. Chichester: John Wiley & Sons Ltd.
Kapferer, J. N. (2008). New strategic brand management: creating and sustaining brand equity long term. London: Kogan Page. Kavaratzis, M. (2004). From city marketing to city branding: Towards a theoretical framework for developing city brands. Place Branding, 1(1), 58-73. Kavaratzis, M. (2009). Cities and their brands: Lessons from corporate branding. Place Branding and Public Diplomacy, 5(1), 26-37. Kavaratzis, M., Warnaby, G., & Ashworth, G. J. (2015). Rethinking Place Branding. Cham:Springer. Koo, J.-R. (2008). Evaluation and Indexation of City Brand Equity. Productivity Review, 223(3), 177-205. Morgan, N., Pride, R., & Pritchard, A. (2011). Destination brands: managing place reputation Amsterdam: Elsevier. Morgan, N., Pritchard, A., & Pride, R. (2004). Destination Branding: Creating the Unique Destination Proposition: Elsevier Butterworth-Heinemann. Musterd, S., & Kovacs, Z. (2013). Place-making and Policies for Competitive Cities Chicester Wiley. Paddison, R. (1993). City Marketing, Image Reconstruction and Urban Regeneration. Glasgow University of Glasgow. Riza, M. (2015). Culture and City Branding: Mega-Events and Iconic Buildings as Fragile Means to Brand the City. Open Journal of Social Sciences, 3(7), 269-274. Roll, M. (2006). Asian brand strategy: how Asia builds strong brands New York: Palgrave Macmilla. Roll, M. (2015). Asian brand strategy: building and sustaining strong global brands in Asia New York: Palgrave Macmillan. Sorensen, A. & Okata Eds, J. (2011) Megacities: Urban Form, Governance, and Sustainability. Japan: Springer. Strauss, A. L. (1998). Basics of Qualitative Research: Techniques and Procedures for Developing Grounded Theory. Thousand Oaks: Sage Publications. Tapachai, N., and R. Waryszak (2000) An Examination of the Role of Beneficial Image in Tourist Destination Selection. Journal of Travel Research, 39, 37–44. Tybout, A. M., & Calkins, T. (2005). Kellogg on branding. New Jersey: John Wiley & Sons Inc.
United Nations, D. o. E. a. S. A., Population Division. (2014). World Urbanization Prospects: The 2014 Revision. New York: United Nations. Weinrich, N. K. (1999). Hand-on social marketing. Thousand Oaks, CA: Sage Publications Inc.
Zenker, S., & Jacobsen, B. r. P. (2015). Inter-Regional Place Branding: Best Practices, Challenges and Solutions. Cham: Springer.